While there are signs that people were starting to believe the end of the war was in sight, any optimism on that score was balanced by the shortages and privations at home. Food rationing was biting and there was real concern that even with strict rationing, some staple goods would be hard to come by This led to discussions about how farming in particular could be helped - women were urged to join the land army, some people thought German prisoners of war should be used more, while others suggested that discharged soldiers could be trained for jobs in agriculture. So much pressure was there for everyone to work hard, that some felt it necessary to protest that schoolboys should not be expected to work both before and after school. 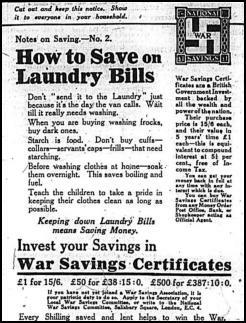 While party politics re-appeared with parties starting to choose candidates for elections whenever they might return, the government was clearly concerned that people might start to think they could ease off on things like war savings schemes.They published a series of weekly advertisements suggesting ways people could make savings on things like boots & shoes, gas and laundry and to put the money saved into the war effort. Politically the main discussion was between those in the minority who were urging the government to take up Germany’s offers of negotiating a peace treaty and those who insisted that the only successful peace could come from the victorious allies imposing terms on their foe. Meanwhile, inevitably, despite paper shortages reducing the size of the newspaper to four pages, much of the space was taken up with the toll of dead and wounded at the front. The links here will take you to pages containing stories published exactly 100 years before. The headlines shown are only a taste of the stories that appear on that page.